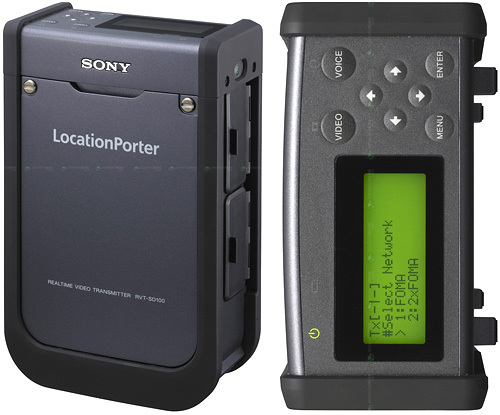 Sony LocationPorter For 3G Video Streaming | OhGizmo! By Andrew Liszewski on 02/03/09 • Leave a comment! Sony’s new LocationPorter is an interesting device. It seems designed for those doing on-site reporting, or who need to provide a live video stream, but don’t have access to a professional broadcast truck or similar type equipment. So instead of a satellite or microwave signal, it relies on the internet via a LAN or 3G connection. From what I can tell you can plug any camcorder or live feed into the LocationPorter, and your video will be converted to H.264 MPEG-4 on the fly, so it can be easily streamed. On a single 3G connection your footage gets smooshed down to a 352×240, 5 to 15fps stream (64 to 160kbps) but the device can actually use two simultaneous 3G connections to boost the data stream up to 320kbps. And when connected to a LAN, the video can be streamed up to 30fps. Unfortunately, as you can see in the video below, the LocationPorter isn’t exactly compact, and has to be worn over the shoulder like a bag. In fact, it reminds me of the VTRs that videographers used to have to carry, before the tape mechanisms were integrated into the cameras. So it’s almost like we’ve taken two steps forward, but one step back.